Subject: What Is a Contested Convention? The 2000 Democratic National Convention in Los Angeles, CA. A brokered convention is different than a contested convention. We've set out a full definition of "brokered convention" here, but put simply, it happens when no single presidential candidate has secured a "supermajority" of delegate votes by the end of the primary season. A contested convention can occur at both Republican and Democratic conventions. It requires a close delegate race going into the convention. You see, every state comes with a certain amount of delegates. Those delegates pledge their votes to a particular candidate in the state's primary election. After that, the delegates' votes are locked in come the convention — they're expected to vote for the candidate chosen by the thousands of voters they represent. So, at the first ballot at the convention, the delegates will vote in favor of the candidate they'd pledged to support. There are also a small number of unbound delegates on the GOP side, and a larger number of superdelegates on the Dem side, that can be won over. The candidate who ends up with a supermajority of delegate votes is presumptively the party's nominee. But, there's a twist. A contested convention can occur. In this case, a candidate who does not have the supermajority may "contest" the supermajority holder's status as elected party nominee. This happened in 1980. That's the year Ted Kennedy attempted to overcome sitting president Jimmy Carter's nomination. Carter went into the 1980 DNC with a supermajority of popular votes at exactly 51%. Kennedy went in with 38%. Approximately 6% of votes were left unpledged. Just below 3% belonged to the California Gov. Jerry Brown. Kennedy challenged the rule that compelled delegates to vote on their first ballot for the candidates to whom they'd pledged to in the primaries. He presented this "contest" on the convention's first night – Aug. 11, 1980 – but it was denied. So the DNC's first ballot went down. Carter maintained the supermajority and therefore won the nomination. On Aug. 12, Ted Kennedy reluctantly conceded the nomination to Carter. This year, 85% of the 4,765 Democratic Party delegates will arrive at the convention having already pledged to a specific candidate during the primaries. The number of delegates needed to win the Democratic nomination this year is 2,383. Sanders has 553 pledged delegates. He needs 2,026 for the majority of the 4,051 pledged delegates. 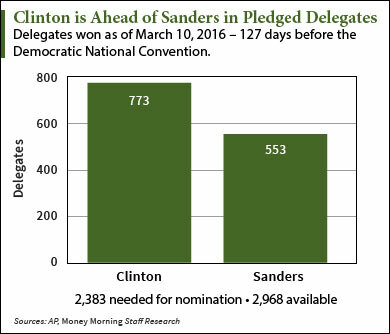 There are 2,736 pledged delegates still to be allocated. So Sanders needs 1,473 of those 2,736, or 54%, to get there. It's not likely that he will. But Sanders' whole candidacy has a tendency to surprise voters when they least expect it. Let's not forget about what happened last Tuesday, when the Vermont senator shocked the punditry yet again. He took Michigan — a state where polls showed him down by more than 20 points. Say Sanders and Clinton arrive at the DNC both carrying a proximate amount of pledged delegates – though one will have more than the other. Sanders at this point could "pull a Ted Kennedy" and contest the convention to release the delegates from their pledges of support. If he wins the contest, the delegates could vote unbound to any candidate. Regardless of whether a convention is contested, superdelegates are unpledged, unbound voters. Unlike elected delegates, superdelegates may switch their support to whichever candidate, whenever they like. Superdelegates could be the ultimate tiebreakers that could prevent a contested convention, adding their numbers to give one candidate a more decisive lead. Superdelegates make up about 15% of total Democratic delegates. They did not officially exist until 1982 when the DNC adopted a rule that set aside some delegate slots for elite members of the party – Congressmen, chairs, and vice chairs. If Sanders successfully contested the Democratic convention, a sort of auction of delegates would begin. Both the superdelegates and regular delegates would be able to vote for whomever they so choose. They would all talk, negotiate, and vote amongst each other until the official ballot is taken. And the candidate with the most votes wins the party's nomination – regardless of whether he or she was the top choice of the American voting public, as spoken in the primaries. VICE News: What Is a 'Brokered Convention' Anyway and Can It Stop Trump?